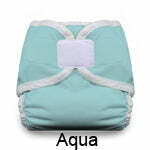 Thirsties (Original) Diaper Covers in Aplix hook and loop closure. Preemie size available. The sizes large is the next size up after Thirsties Duo size 2 is outgrown. Iris color is discontinued. 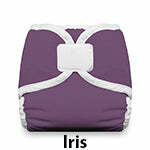 Save on our remaining stock of Iris. 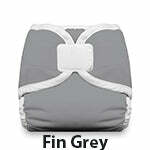 Order 6 or more total of any closure or size of the Thirsties Diaper Cover and save 5%. Add them to your cart to see the savings in your cart. The hook and loop version is on this page. The snap version is here. Don't confuse this sized cover with the Duo Wrap. The Thirsties Cover does NOT have snap rise adjustments. This is a true sized cover which comes in sizes Newborn/Preemie through Large. When Thirsties Duo size 2 is getting too small on your toddler, the size Large cover is the next size up. Large is bigger than Duo size 2 but smaller than Duo size 3. It has room enough inside for a nighttime diaper. The newborn-preemie size is suitable for preemies or for those who want something tiny and not bulky that truly fits your brand new full term baby for the couple of weeks. Use this over a preemie, newbie or newborn prefold (but not for over Newborn Workhorse since this cover is tiny). The x-small size is good over Workhorse size small or for skipping size newborn diapers and starting in small or novice size prefolds. Understand that is will be big at first but it can be workable and newborn babies do grow quickly. Size small fits over the size medium Workhorse and size medium fits over the size large Workhorse, generally. Don't go by just the size name (such as "small") but instead pay attention to the weight ranges because the size names vary from product to product. When planning your diaper stash, remember that paper and pen notes still work very well to help you figure things out. There are no rise snaps on this cover. Thirsties is a simple wrap-style cover with leg gussets. It is an exposed laminate cover which is also referred to as a "wipe-clean" interior. The PUL (waterproofing) is exposed on the inside for a more slick, wipe-clean surface. Simple and effective. 100% polyester with TPU laminate. FREE of VOCs, PVC, phthalates, lead, and latex. Made in the USA. Preemie/Newborn is for tiny newborns. Oak and Acorn limited edition print pictured has sold out but this picture still shows this tiny size nicely. In size Large, this is one of the few covers that fits really well over the XL Workhorse or XL Prefolds. Actually having a cover that fits correctly is important in both the small and large sizes. Most adjustable covers are really adjustable "mediums" and don't fit well on newborns or bigger toddlers. Really like that I can toss these in the washing machine. Easy to use. I have been consistently happy with these covers and love the great fit of the sized covers. I just wish they'd go back to using the older style aplix, the new stuff is too wide for tiny babies. 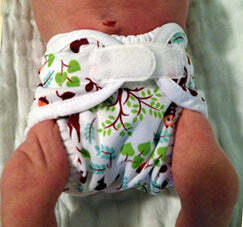 We’re new to cloth diapers and very happy with the prefolds and Thirsties covers we bought. it really keeps the pee in over night. Double gussets are a must! We tried Bum Genius, Alva, LBB, Rumparooz, and G Diapers and had so many leaks that I was at my wits end with cloth diapering. A friend recommended these and we have not had a single leak! Highly impressed! The covers are cute and functional, the double gussets are a MUST! WE LOVE THESE!